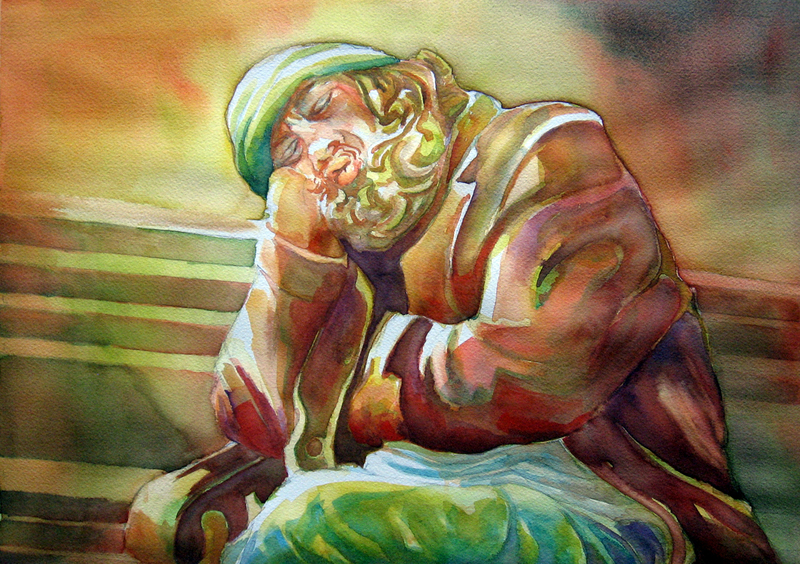 Echostains Blog has recently posted about an artist who paints faceless figures. Take time to check the post out here. The artist she researched leaves his figures faceless for different reasons than I did. I believe I have mentioned on a previous post that I learned to draw by drawing figures. I took from a very talented teacher who suggested we learn to draw by choosing subjects we believed we never thought we could draw. I chose people. 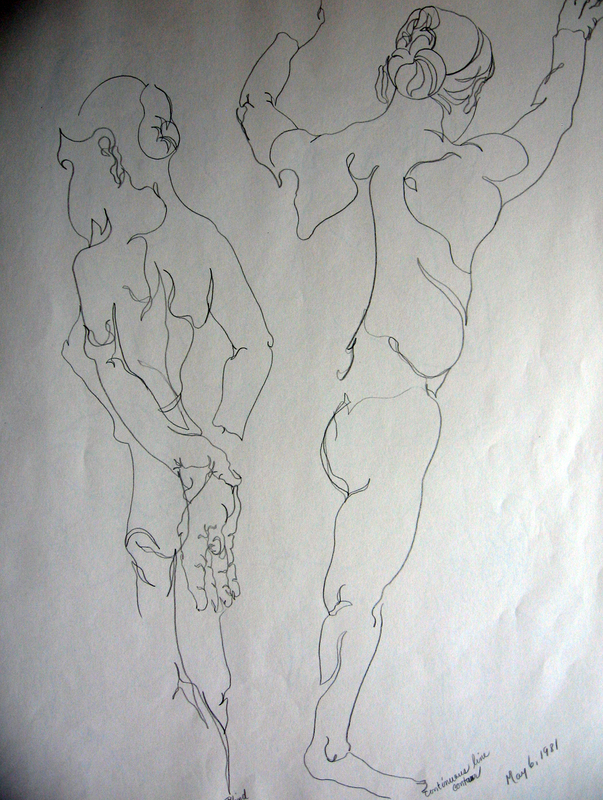 The above drawings were done in 1981. 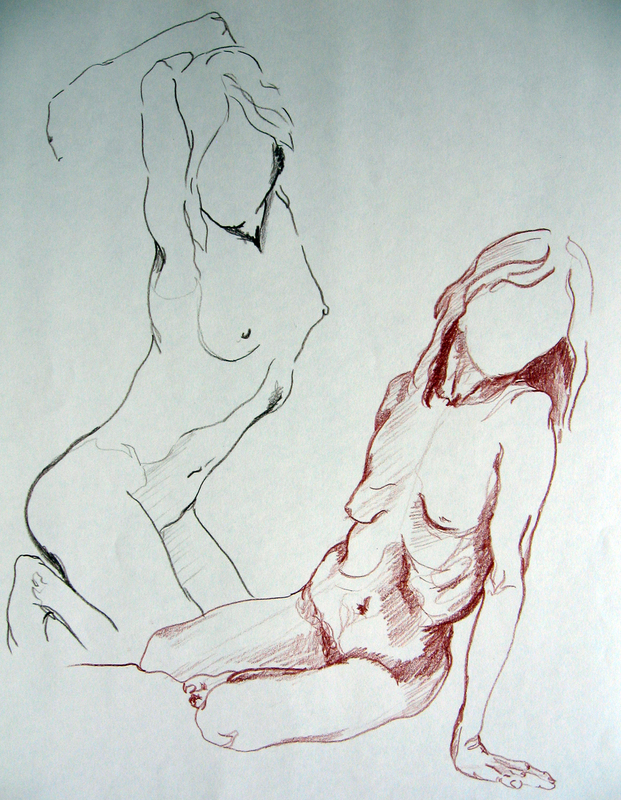 I had taken drawing classes for a year’s time by the time I drew these and my drawings were largely of people. About a year into drawing, I hit a wall and was frustrated by my figures and not seeming to grow very much. 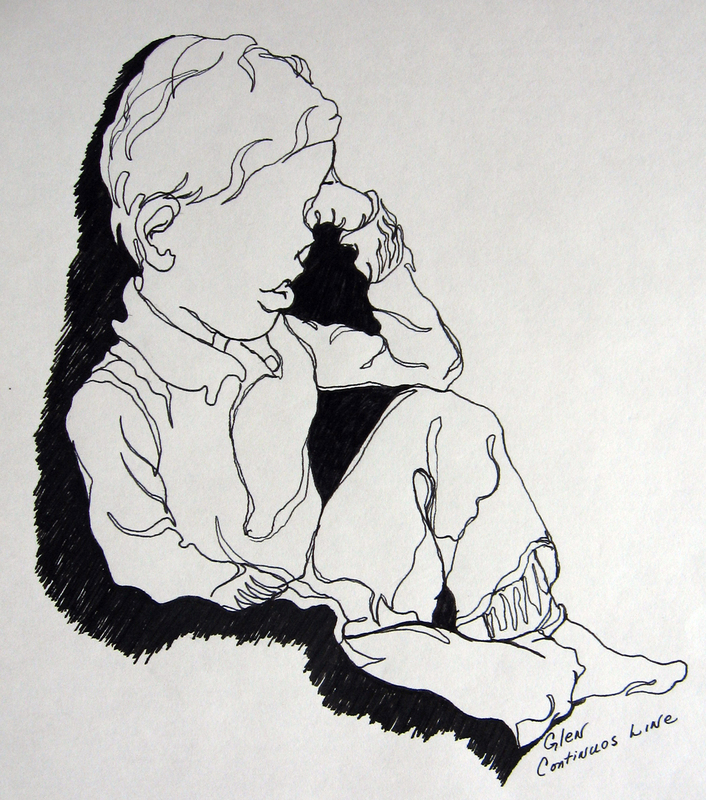 Instead of telling me I had hit a brick wall or saying to me that she did not like my faces, this teacher said, ” I wonder what would happen if you left the faces off?” I went home that night and drew the first drawing you see, above, titled self portrait. I was off and running and did not look back for about 6 months. Everything I drew had no face. If I drew my family, I left the faces out or drew their backs. 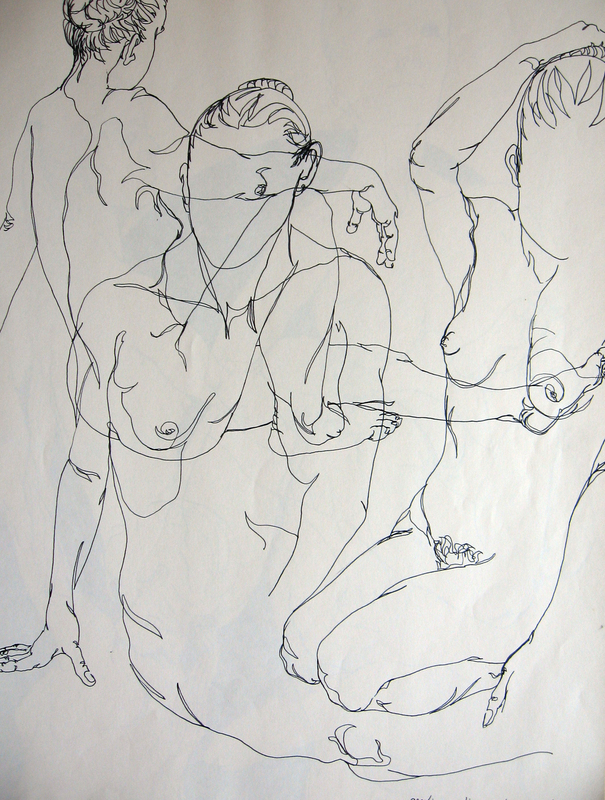 If it was at life drawing sessions, I left faces out and began drawing figures over figures and portions of figures. What I learned is that I was concentrating too much on the face and missing the whole idea of the pose and the majority of a figure. This was a freeing exercise for me and one I will never forget. 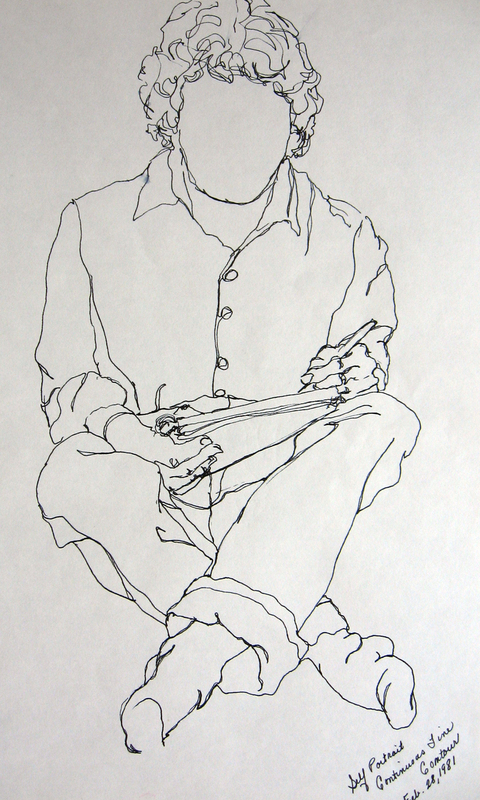 Another artist who does faceless figures is Duck Billed Platitudes found here. This painting was a continuation of my studies with the Don Andrew’s DVDs from the previous post. 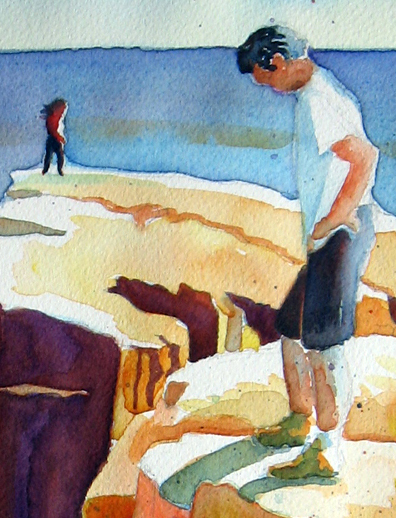 I was not totally happy with the water washes I had created in the last painting and I lost the light in my washes on the prominent foreground cliff platform where the viewer stood. 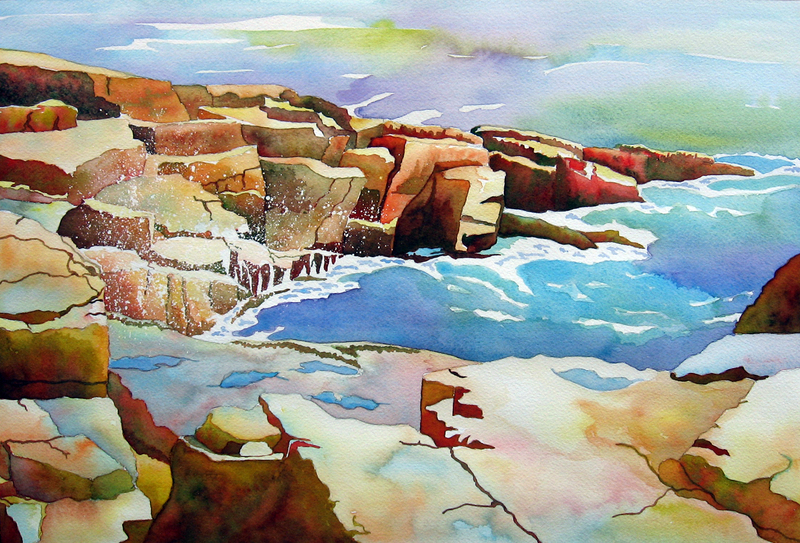 In this one I concentrated on painting my washes in such a way as to enhance the flow of the water and retain the light and washes mingling together on the forground cliffs. I attempted to lead the viewer’s eye through the darks of the cliffs and the white caps on the water to the area where the waves were crashing. 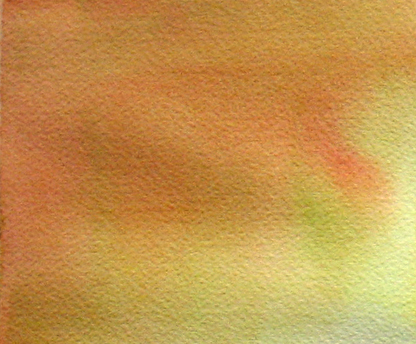 To make the white dots of spray, I splattered with masking fluid or what some artists call liquid frisket. I was careful to surround the area I wished to splatter with newspaper so I had some control of the area to be splattered. I soaped the end of a wet round brush (the soap helps to protect your brush from damage from the masking fluid). I then dipped the brush in the masking fluid and tapped the handle of the brush on a pencil that I held in my other hand over the area to be splattered. The abstract qualities to a landscape are increasingly interesting me and I am beginning to see that I can use Andrew’s teachings and begin to apply them to the way I normally paint. This one was fun! The first thing I learned was how to create a pathway of light by leaving that pathway white and painting into it, not totally eliminating it. 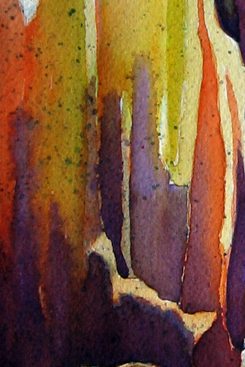 This seemed to enhance the feeling of light in these paintings. Too much and the painting looks speckled. Carefully designed pathways give the viewer a path to follow. The above washes were actually built up two or three times, re-wetting the paper as I went. Another thing I learned is to build up darks and more intricate brushstrokes and detail around what I considered to be the main focus of the painting. 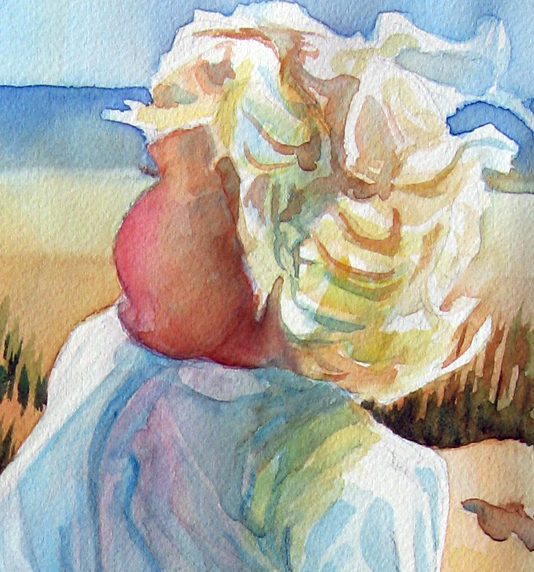 An example would be the head of the little girl in “Seeing Lake Michigan”. 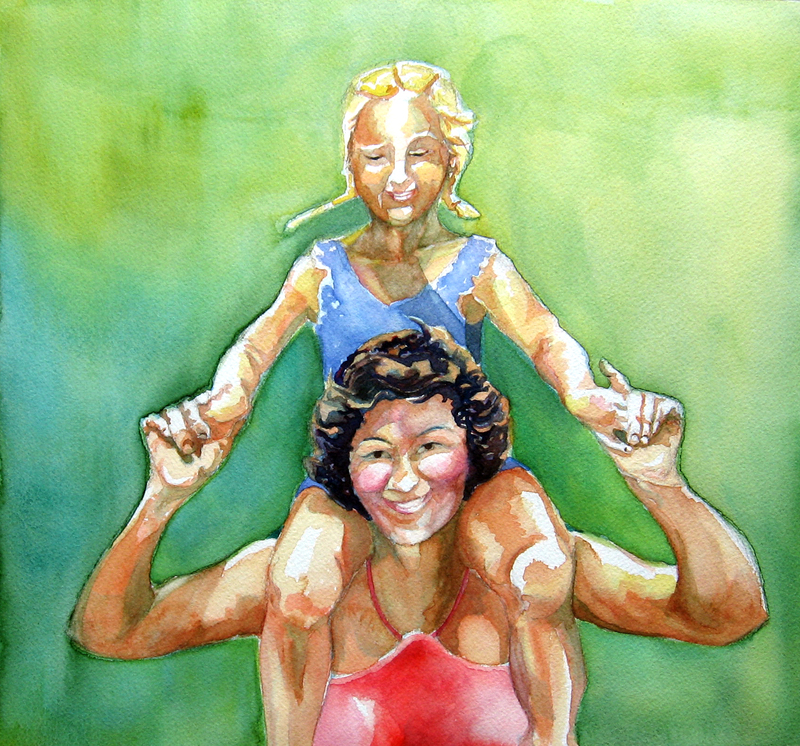 I tried to place more brushstrokes and color in and around her cheek by varying my line and including more of them, I tried to frame the head between two sunlit shoulders and lead the viwers eye ever-closer through the intricate wrinkles in her shirt and the swooping lines of her strands of hair. In the past, I would not have thought to allow the blue from the jeans to run into the fleshtone of the legs. I still have another DVD to view and need much more practice with these ideas. I find myself concentrating a little too hard and need to grasp this idea of making large flowing washes, develop better paths of light and create more fun tiny figures, but I like the guidelines he offers. NOTE* I am not advertising these DVDs nor do I receive anything by sharing what I’ve learned from them. I am just sharing some of the things I have tried and learned. 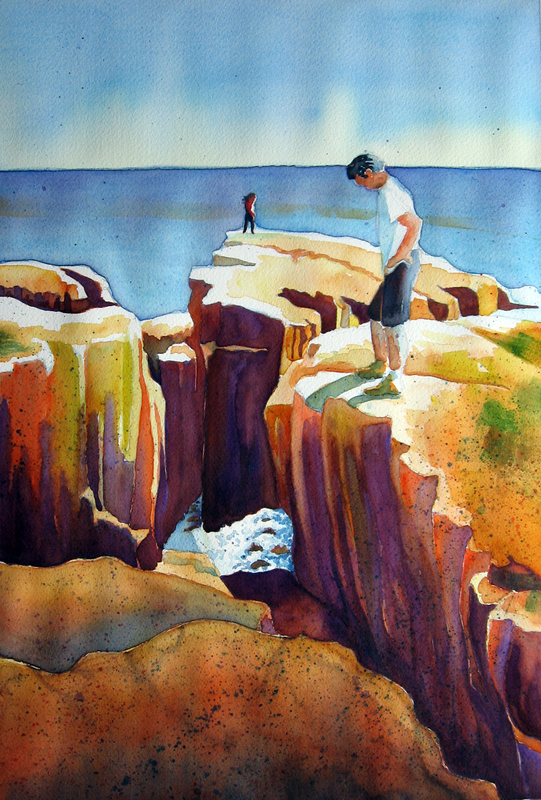 Stephen Kellogg has just submitted a poem inspired by the above painting, “Maine Coastline”. I like how he took the two characters and created a story about them. 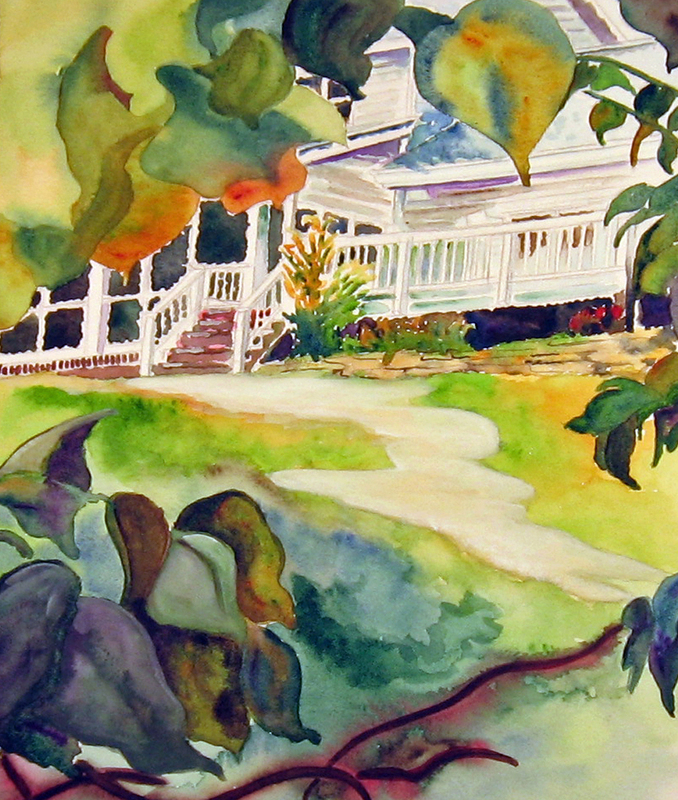 This is a watercolor sketch I did a few years ago of my sister’s home. I had wanted to see if I could do a view of her home looking up the hill through some of the branches of a tree at the baseof the hill. It was really kind of fun trying to get the angles of the deck and porch and the small portion of the house I could see. The other challenge was getting the leaves and branches to read well in the foreground. I found that I needed to darken the foreground branches and leaves to get it to have depth. I like to play around with different points of view. 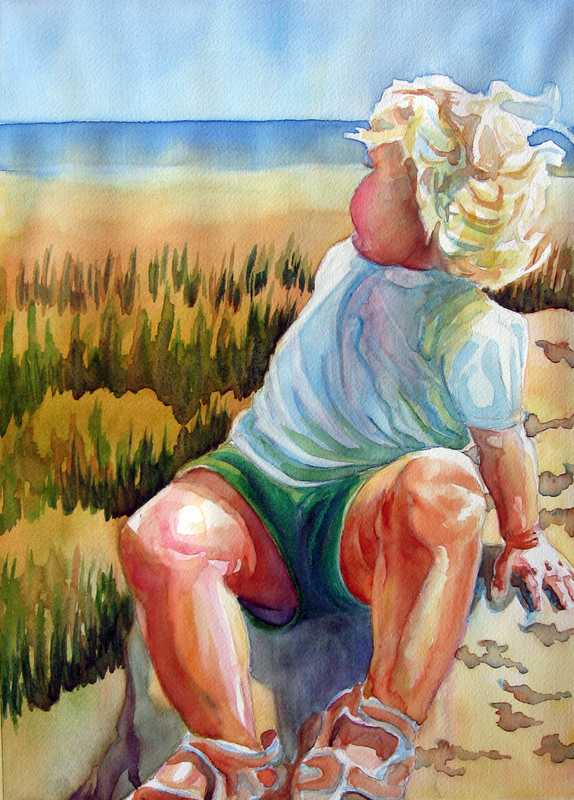 Have you ever had a painting that took another path than the one you had planned? That was the case with this one, for me. My sister took a road trip to visit her daughter in Tucson and snapped some pictures along the way for me to use as reference material. 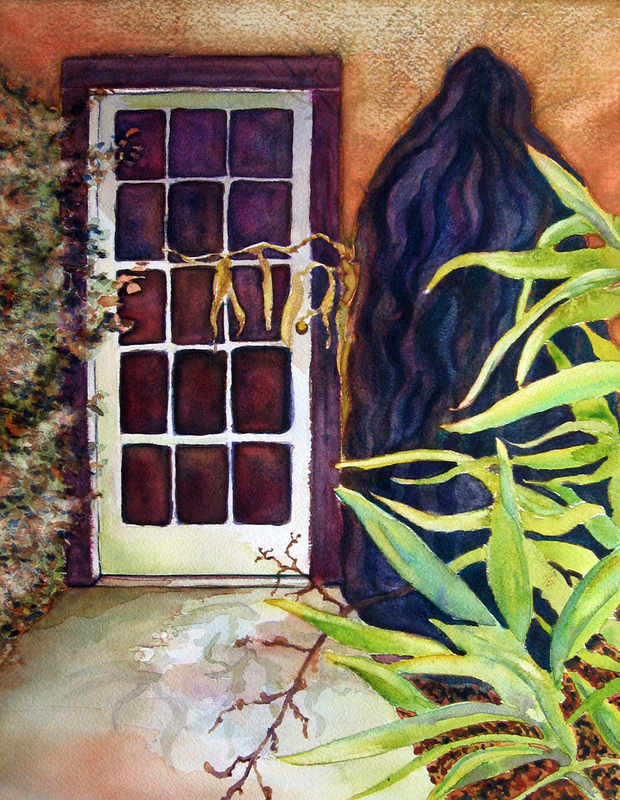 This is from a photograph of a doorway to her room at a bed and breakfast in New Mexico. I thought it would be a good subject for a quick sketch and it turned into a many-day venture. The more I worked on it, the creepier it became. The first big challenge was that huge sasquatch-looking plant next to the door. Honest! That is what it looked like! I’ve stared at it and stared at it. My sister couldn’t even figure out what it was. The second thing that threw me off was the subdued light. Try as I might I could not find much of a way to cast light on things, here. As a result, I subdued it too! Two large strands of plants crossed over the walkway that made it look even more foreboding, even though the green plant in the foreground seemed to beckon and point one to the door. This was the first time my Grand daughter saw Lake Michigan. I remember the first time I swam in Lake Michigan and the first time I went running into the ocean. There is something special about the grandeur of it all.